In a way, today’s announcement that Marvel has commissioned a 13-foot-tall bronze statue of Captain America is a victory for geekdom. We may all now bow before our idol and burn effigies of the Red Skull at his feet (unless he’s … working for the Red Skull?!?!?). 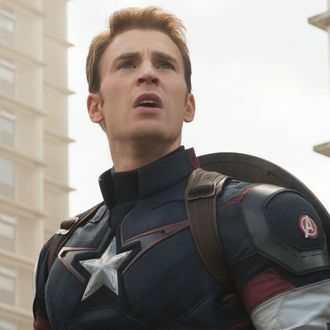 But here’s the catch: the statue will stand in Brooklyn’s Prospect Park and bear the Captain America: The First Avenger quotation: “I’m just a kid from Brooklyn.” This is a travesty. As every real geek knows (*pushes glasses up nose*) the comics version of Cap was from Manhattan’s Lower East Side. Sure, his movie incarnation is a Brooklyn lad, but this is a blatant usurpation of comics continuity by filmic derivatives. What’s next, a painting in the National Portrait Gallery of Superman snapping someone’s neck? A mural commemorating the childhood friendship of Charles Xavier and Mystique? Unbelievable.